U.S. policy in Eurasia, and the regional politics of oil. Personal web page. • Dr. Niklas L. P. Swanström (photo to the right), Director and one of the cofounders of the ISDP. Personal web page. • Dr. Svante E. Cornell, Director and one of the cofounders of the ISDP. Personal web page. ISDP is an independent and non-profit research and policy institute. It was established in Stockholm in October 2007, but it has its roots in the Silk Road Studies Program (SRSP) that was launched at Uppsala University in 2002. Most of the staff from SRSP moved to Stockholm. The Institute is dedicated to expanding understanding of international affairs, particularly the interrelationship between the issue areas of conflict, security and development, and has a core funding from the Swedish government/Ministry of Foreign Affairs. The Institute’s primary areas of geographic focus are Asia and Europe’s neighborhood. The institute is also involved in close collaboration with Paul H. Nitze School of Advanced International Studies at Johns Hopkins University in Washington D.C., USA. The ISDP regularly invites distinguished guest researchers for longer or shorter periods of time. The exchange of knowledge that follows from providing researchers with the opportunity to conduct research at the ISDP, further enriches the research with additional perspectives and insights. The Institute also benefits from having a set of associated researchers linked to itself. By continuing to tie experts and distinguished researchers to its various endeavors, the ISDP is further advancing its aspiration of serving as the focal point for American and European academic and policy discussion regarding contemporary security issues in the region. The ISDP is led by two Directors and two Deputy Directors, with overall responsibility for the ISDP activities. These are joined by Research Fellows and Project Coordinators with specific responsibilities for individual projects. ISDP has two constituent parts: Central Asia-Caucasus Institute & Silk Road Studies Program, and the Asia Program. 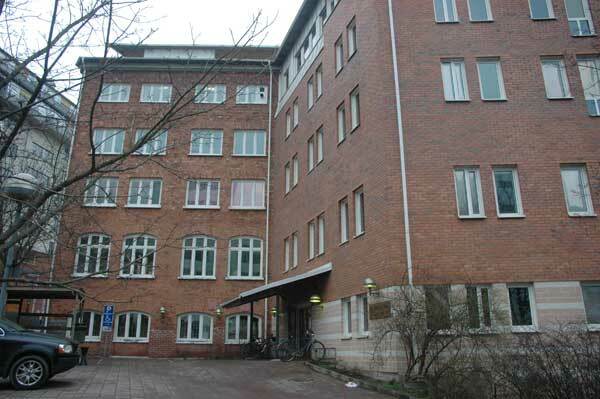 On Wednesday 12 March 2008, SASNET’s deputy director Lars Eklund visited the Institute for Security and Development Policy (ISDP) in Nacka-Stockholm. A fruitful meeting was organised by ISDP’s deputy director Robert Nilsson (photo to the right), in order for Lars to present SASNET to the Director Niklas Swanström and other ISDP researchers currently working on projects related to South Asia and Afghanistan (see below). A direct successor of the so-called Silk Road Studies Programme that existed at Uppsala University during the period 2002–2007. It is now run as a joint Transatlantic Research and Policy Center in collaboration between ISDP in Stockholm and the Johns Hopkins University’s School of Advanced International Studies in Washington D.C. Realizing the complementary of their aims, as well as the added value of structured cooperation in research, teaching, and publications, Uppsala University’s Silk Road Studies Program and the Central Asia-Caucasus Institute of Johns Hopkins University resolved already in 2005 to formally merge into a joint center, the first of its kind in Europe and North America. The aim was to respond to the increasing need for authoritative research and analyses on these critically important but little-studied regions. It focused exclusively on contemporary issues in the ancient Silk Road area. Today it is firmly established as a leading center for research and policy worldwide, serving a large and diverse community of analysts, scholars, policy-watchers, business leaders and journalists. CACI & SRSP focuses mainly on the western part of Eurasia, including Central Asia, Eastern Europe, Caucasus, and the Baltic Sea regions. It publishes the CACI Analyst, the China and Eurasia Forum Quarterly, and the Silk Road Paper series. Full information about all research projects at the Central Asia-Caucasus Institute & Silk Road Studies Program. More oriented towards the Eastern part of the Eurasian continent including the East Asia, Central Asia, and South Asia. The aim of the Program is to function as a focal point for academic, policy, and public discussion of the region through its applied research, its publications, research cooperation, public lectures and seminars. The Asia Program publishes the Asia Paper series and the Policy Paper series. The Asia Program fosters both fundamental and applied research in a wide range of disciplines in the social sciences and humanities, with a focus on issues of conflict, security and development. This research ranges from short research projects involving a sole researcher to larger, multi-year cooperative endeavors involving numerous researchers. This research is undertaken mainly at the institute’s offices, but often involves sponsoring research in the field. The Program often receives scholars in Stockholm, either as Fellows or Guest Scholars. With funding either from the Institute itself or from collaborating institutions or sponsors, such visitors carry out research leading to monographs, articles, policy papers, or presentations in various media. Scholars stay for periods ranging from a few weeks to a year or more. The Program’s research is conducted along thematic as well as regional lines. These thematic and geographic research areas typically involve several specific sub-projects. This site provides the opportunity to browse the Institute’s research either thematically or geographically. In recent years, a few researchers within ISDP have focused on India/South Asia, among them Ingolf Kiesow, Ambassador (Retd) & Senior Research Fellow; and Nicklas Norling, Project Coordinator of the Joint Center’s Regional Security project. Ingolf Kiesow has worked for the Swedish Ministry of Foreign Affairs for many years, serving most of his life as a diplomat in countries in Asia, inter alia New Delhi, Pyongyang, Tokyo and Vientiane. His many years as an active diplomat in Asia and the Middle East has provided him with in-depth knowledge regarding conflict issues and conflict resolution mechanisms at the very highest political and military levels. In addition to his position at the Foreign Ministry, Ambassador Kiesow is also a Researcher at the National Defence Research Agency in Stockholm, Sweden, where he is conducting research at the department of defence analysis. Ambassador Kiesow is also a member of the Royal War Science Academy of Sweden and the International Institute for Strategic Studies in London and he served as the Head of Chancery of the Stockholm Conference on European Security and Confidence Building Measures in 1983-84. Personal web page. Mr. Ingolf Kiesow has now left ISDP, and in July 2010 he launched his own consultancy firm, called KIESOW KONSULT. Mr. Norling holds a MA degree in Political Science from Stockholm University, and has also pursued graduate studies at Stockholm University’s International Graduate Program, at Uppsala University and at the Swedish National Defence University. He currently specializes in Central Asia, South Asia, and the Middle East at the center, and his main expertise are in the fields of regional cooperation, trade, and security issues. He is also the coordinator and initiator (together with Niklas Swanström) of a project on energy and confidence-building in Eurasia. Personal web page. One researcher focuses on Afghanistan, namely Karl Harbo, Senior Research Fellow. Mr. Harbo joined the institute in February 2007, after retiring from the European Commission. From 2002-2006 he served as Head of the Delegation of the European Commission to Afghanistan. Personal web page. Saira Wolvén, with an expertise in Domestic politics in Bangladesh, is project coordinator at ISDP, connected to the Central Asia-Caucasus Institute & Silk Road Studies Program. She has previously worked for Sida in Stockholm and the United Nations Office for the Coordination of Humanitarian Affairs in DR Congo. ISDP runs a research programme on Conflict Management and Mediation. The project is part of the by the Swedish Ministry for Foreign Affairs funded research on Conflict and Security in Asia. Since 2003 the bulk of the research has been undertaken within a project on Conflict Management in Northeast Asia, but from 2005 a special project on ”Nepal: building capacity in conflict management”, has been funded by the Swedish Minstry for Foreign Affairs. The project deals with the violent conflict that Nepal has experienced since 1996. The main purpose has been to assist in creating a foundation for conflict management within Nepal. The project is led by Dr. Niklas L. P. Swanström. More information about the Capacity Building and Conflict Management in Nepal project. As part of a new research project on Political Roles of Religious Communities, led by Ingolf Kiesow. So far two conferences have been organised, the most recent one focused on ”The Political Roles of Religious Communities in Northern India”. It was held in Kolkata, India, on 16–17 January 2008. The conference was organised by ISDP in cooperation with Maulana Abul Kalam Azad Institute of Asian Studies (MAKAIAS) on Kolkata. The Swedish participants included Prof. Ishtiaq Ahmed, Dept. of Political Science, Stockholm University (but during 2007-08 being Visiting Research Scholar at the Institute of South Asian Studies, National University of Singapore). The Kolkata conference was the second conference held within this project. The first conference was held in Islamabad, Pakistan on 29–30 October 2007, and dealt with ”The Political Roles of Religious Communities in South Asia-Pakistan”. The seminar participants consist of nationals from Afghanistan, Pakistan India and Sweden. The aim is to have as diverse a list of participants as possible including representatives from government, minority organizations, academia, and non-governmental organizations (NGOs). The focus of the local seminars is multidisciplinary, including perspectives from sociology, economy, political science, law, and the history of religions. Three seminars have been held, one in Islamabad, one in Kolkata and one in Kabul. A workshop with a wider regional focus is being prepared for February 2010 in Singapore. The main aim of the workshop is to continue on the discussions in the local seminars but adopting a wider perspective. The workshop will focus on the political roles of religious communities in South Asia in its entirety and how their roles relate to the wider strategic picture of the region. More information about the Political Roles of Religious Communities project. Another ISDP research programme focuses on State Building, Governance and Human Rights, partly dealing with Nepal. Till 2007, ISDP also ran a research programme on Environmental Security in Asia. The purpose of the project was to understand to what extent environmental security issues contribute to intrastate conflicts and, ultimately, state failure. Within the field of environmental security, this research specifically analyzes the way that renewable natural resource scarcity contributes to intrastate conflicts. Country case studies were used for comparative analysis and to draw appropriate lessons learned for policy makers. Dr. Fiona J.Y. Rotberg was Director for the project. She is however no more connected to ISDP. Instead she is working at the Dept. of Government, Uppsala University. Within the framework of the Environmental Security in Asia project, a one day forum entitled “Nepal Water Security Forum” was arranged in Uppsala on Tuesday 27 March 2007. It was organised by Dr. Rotberg in collaboration with Prof. Ashok Swain from the Dept. of Peace and Conflict Studies, Uppsala University. The participants in the forum also included Mr. Ajaya Dixit, founder of the Nepal Water Conservation Foundation, Kathmandu, Nepal; Dr. Ashok Regmi, Research Associate at the Workshop in Political Theory and Policy Analysis, Indiana University, USA; Dr. Ganesh Shivakoti, Professor of Agricultural and Natural Resources Economics at the School of Environment, Resources and Development, Asian Institute of Technology in Bangkok, Thailand; and Dr. Bishnu Raj Upreti, Regional Coordinator of the National Centre of Competence in Research’s (NCCR) Programme North South, Kathmandu, Nepal. The results from the one day forum has been published as a book titled ”Natural Resources Security in South Asia: Nepal’s Water”, a volume edited by Dr. Fiona Rotberg and Dr. Ashok Swain. Go for the full book. PhD Candidate Martina Klimesova is based at Charles University in Prague, Czech Republic, but is also working as a conflict management training coordinator at ISDP. Her research focuses on third party involvement in peace negotiations, conflict-development nexus, and the employment of incentives in peace processes. Ms. Klimesova holds a Licentiate degree from the Institute of Political Science at Charles University in Prague; her licentiate thesis dealt with applying a fair division mechanism to the conflict in Sri Lanka. She also holds MA degrees from Uppsala University (Department of Peace and Conflict Research) and Charles University in Prague (Department of International Relations). Additionally, she is responsible for outreach coordination at ISDP. During summer 2009, Ms. Klimesova was a Visiting Research Associate at S. Rajaratnam School of International Studies (RSIS) at the Nanyang Technological University (NTU) in Singapore. The stay was funded by a travel grant from the Swedish School of Advanced Asia Pacific Studies (SSAAPS) at STINT and a grant from Helge Ax:son Johnsons Foundation. Personal web page. In January 2010, a paper by Ms. Klimesova was published as a ISDP Policy Brief (No. 16, January 29, 2010). It is entitled ”Sri Lanka: Towards Reconciliation? Implications of Mahinda Rajapaska’s Election Victory”. Read the article (as a pdf file). Dr. Jagannath Prasad Panda from the Institute for Defence Studies and Analyses (IDSA) in New Delhi, India is a guest researcher at ISDP during the period September – November 2010. IDSA is a premier think-tank under the Govt. of India. Dr. Panda is also the managing Editor for Peace and Development Digest, published by the Foundation for Peace and Sustainable Development, New Delhi. He defended his doctoral dissertation in 2007 at the School of International Studies, Jawaharlal Nehru University (JNU), New Delhi. His research interests focuses on Sino-Indian relations. He is preparing a paper on ”China, India and BRIC: Realist Interpretation of a Multi-polar World Order”. On Wednesday 29 September 2010, Dr. Panda held a SASNET lecture at Lund University on ”The Pattern of Sino-Indian Relations: Evaluating the Strategic Discourse”. The seminar was organised in collaboration with the Department of Political Science, Lund University. Venue for the seminar: Main conference hall (room 366), 2nd floor, Dept. of Political Science, Paradisgatan 5, Lund. More information. He will also participated in a seminar in Stockholm on ”Regional Power and Maritime Security in Asia”, on Thursday 7 October 2010. The seminar was organised by the Stockholm Asia Security Group, a joint initiative of ISDP; Utrikespolitiska Institutet (UI); European Institute of Japanese Studies (EIJS) at Stockholm School of Economics; and Stockholm International Peace Research Institute (SIPRI). This seminar examined maritime security issues in Asia from a broader context from the Sea of Japan (East Sea) to the Indian Ocean. It also discussed particular points of major regional power’s maritime security policies with a view to considering their relevance in the construction of a system of cooperative maritime security in Asia. Dr. Panda gave a presentation entitled ”Fighting for the Indian Ocean: Policy Directives of China and India”. Other speakers included Prof. Tom Hart, China Economics Research Center at Stockholm School of Economics, Prof. Sato Yoichiro, Ritsumeikan Asia Pacific University, and Dr. Stefan Eklöf Amirell, Swedish Institute of International Affairs. Full information. Several projects partly focus on Central Asia, including Afghanistan. One of these projects, namely the project on Organized Crime ad Security in Eurasia, involve studies on the drugs situation in Afghanistan. More information. A couple of research papers dealing with Afghanistan have been published in the so-called Silk Road Papers series recently. In 2005, Dr. Starr published ”A ‘Greater Central Asia Partnership’ for Afghanistan and Its Neighbors” (go for it!, as a pdf-file). In line with the aim of the Program for Contemporary Silk Road Studies to function as a focal point for the academic, policy, and public debate a forum has been created focused on issues and current events of importance for the Silk Road area. The forum emphasizes the importance of public discussion and the sharing if ideas and knowledge; external speakers are invited to hold speeches, workshops and panels are arranged, and public lectures are given by both the program’s staff and external speakers. On 23 November 2004 a seminar was arranged on ”Afghanistan After the Elections: Development, Drugs and Security”. Speakers were Svante Cornell, Bengt Kristiansson from the Swedish Committee for Afghanistan, and Shahin Eghraghi from ISAF in Afghanistan. In 2007, a volume titled ”The New Silk Roads. Transport and Trade in Greater Central Asia” was published. It is edited by S. Frederick Starr, and includes contributions by eminent scholars from sixteen countries (including Afghanistan, Pakistan and India), reviewing the state of the links of transport and trade that are bringing about this fundamental change on the world’s largest continent. It explores the potential of such interchange for fifteen of the countries most directly affected by it. It identifies some of the many impediments to the full realization of this epochal project. And it suggests a few steps that might be taken to ameliorate or remove these impediments. All articles available as pdf-files. • ”The Rise of India: Problems and Opportunities”, by Ingolf Kiesow and Nicklas Norling (Silk Road Paper, January 2007). Go for the full-text paper, as a pdf-file. • ”Bangladesh: The Adolescence”, by Saira Wolvén (Asia Paper, August 2007). Go for the full-text paper, as a pdf-file. • ”Pakistan’s Crisis: Incremental Steps toward Sustainable Democracy”, by Ingolf Kiesow, Nicklas Norling, Svante Cornell and Niklas Swanström (Policy Paper, January 2008). Go for the full-text paper, as a pdf-file.